The U.S. Coast Guard has recently announced new efforts to reduce the number of AIS transponder errors and will be enforcing compliance with civil penalties and fines. As a leader in the AIS world, Milltech Marine wanted to find out how widespread the problem really is, and after talking with the AIS lead at the Navigation Center for the USCG, the results are startling. A snapshot from a single day of data collection from southern California showed half of all transponders weren't transmitting the correct information, which included both Class A and Class B transponders. For certain vessel categories (fishing vessels) the error percentage is as high as 79% which indicates the Coast Guard has a long list to work through before reaching 100% accuracy. Beyond avoiding fines, penalties, or getting the basic value out of your equipment, the primary incentive in making sure your AIS transponder is working correctly should be collision-avoidance. The past few months have been peppered with high-profile ship collisions, and in each case minor navigational issues resulted in major catastrophes. The tragic part about many of these accidents is that the investigators generally agree they could have been avoided if AIS systems were properly employed. It's no wonder the Coast Guard is taking this seriously especially considering as many as 42% of government vessels from the report showed at least one AIS error. Incorrect MMSI – Relevant to all vessels, and crucial in the event of emergency assistance. Incorrect IMO number – Relevant to Class A vessels specifically. Call Sign discrepancies – Call signs are issued by the FCC or other national licensing authority when you apply for a ship’s radio license, which is a requirement for any international travel. If you don't have an FCC-issued call sign you shouldn't make one up - just leave that field blank. Many boaters put their vessel name in that field. That is not allowed. 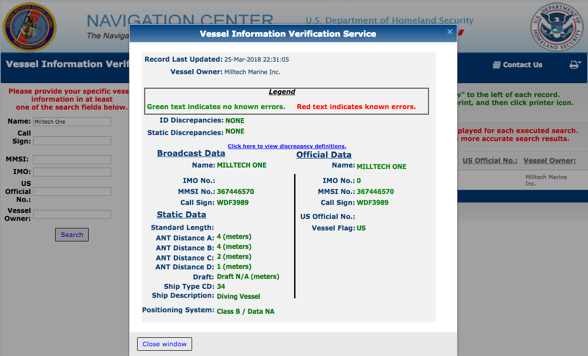 Vessel Name discrepancies – One of the more common mistakes being made is indicating the vessel type in the name. The AIS should be programmed with the vessel name alone. You must not use a prefix such as F/V, S/V, M/V, or any other prefixes. The name must match exactly what is on you MMSI issuing document. 0-Meter Vessel Length (or draft) – This makes up 11% of the total errors, and while tankers seem to have the best record on compliance for this category, the thought that even one 400-meter supertanker could be indistinguishable from a 10-meter fishing vessel should stress the importance of 100% accurate reporting. Undefined Ship Type – Again, in high-traffic areas this can lead to potentially hazardous situations. For further information on how an AIS transponder should be programmed, see the USCG guidance here. For AIS carriage requirements see the USCG page or consult your local authority. NOTE: All Class B AIS transponders sold in the U.S. are required to be programmed by the dealer who sells the unit to you, so part of the problem is not all dealers are taking the necessary steps to make sure their customers are compliant and safe. At Milltech Marine, we preprogram for free every AIS Class B transponder that is shipped to an end user at a US address. We also keep a log of every device that is programmed. Once your AIS Class B transponder is programmed, the MMSI cannot be changed except by a dealer. Other parameters can be changed and if you make those changes be sure to enter correct information. For example, if you change the name of your boat, make sure your vessel record at the FCC or your MMSI issuing authority has also been changed. It is important to also note, that an MMSI is tied to the vessel owner, the vessel and the country of registry. If any of these change (e.g. you buy a new boat), then you either need to apply for a new MMSI or you need to arrange for the existing MMSI to be assigned appropriately. Milltech Marine offers a reprogramming service for the AIS transponders we sell here. Ultimately, checking for, and fixing these errors is a small task for the individual user, and worth the time it takes to make sure your equipment is functioning correctly. If you're not sure whether your transponder is transmitting correctly, the USCG has an online tool to help you see what they see and what needs correction. Just enter your vessel name and check its status. As always, safe boating and feel free to ask questions or provide feedback in the comments section below.